Gorgeous Newer home with 1st floor master bedroom suite. You'll fall in love the moment you walk into this home. 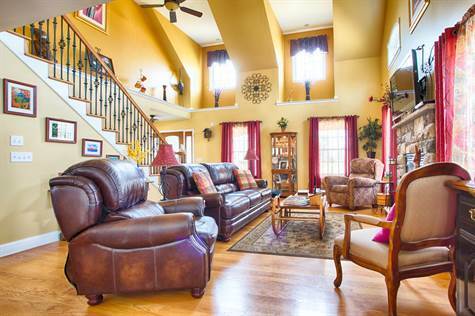 Stunning 2 story living room with plenty of windows and natural sunlight. Open floor concept with eating area and kitchen. Sit back on the built in window seat while sipping early morning coffee and gazing at your beautiful yard. The kitchen is stunning with custom solid wood cabinets and large island w/ granite counters. 1 st floor master bedroom suite has a beautiful master bathroom, tub and walk in shower. Upstairs has 3 bedrooms and another bathroom. The lower level is fully finished with a family room and game room, Full bathroom and daylight. Walk out the slider door onto the stamped concrete large patio. 3 car garage. Corner home. Tons of closets and storage. Window lighting wired to one switch great floor holiday decor. Walk in attic is potential for additional space. Perfect setting w/private tree lined yard. Don't miss seeing this home. You will love it!